Lee E. Lee E. Lee E.
Declaration: Support provided by NIH/NCCAM grant R25 AT002879 (Suppl) and 1K23AT006392. LHR owned the acupuncture practice. The authors report no financial or commercial conflicts of interest. Whole Systems Traditional Chinese Medicine (WS-TCM) added to IVF may be beneficial. WS-TCM and IVF was associated with more live births compared with acupuncture and IVF. WS-TCM and IVF was associated with more live births compared with IVF alone. WS-TCM is individualized and includes acupuncture and other TCM interventions. Patients undergoing IVF may receive either acupuncture or whole-systems traditional Chinese medicine (WS-TCM) as an adjuvant IVF treatment. WS-TCM is a complex intervention that can include acupuncture, Chinese herbal medicine, dietary, lifestyle recommendations. The primary outcome was live birth. Of 1069 non-donor cycles, WS-TCM was associated with greater odds of live birth compared with IVF alone (adjusted odds ratio [AOR] 2.09; 95% confidence interval [CI] 1.36 to 3.21), or embryo transfer with acupuncture only (AOR 1.62; 95% CI 1.04 to 2.52). Of 162 donor cycles, WS-TCM was associated with increased live births compared with all groups (odds Ratio [OR] 3.72; 95% CI 1.05 to 13.24, unadjusted) or embryo transfer with acupuncture only (OR 4.09; 95% CI: 1.02 to 16.38, unadjusted). Overall, IVF with adjuvant WS-TCM was associated with greater odds of live birth in donor and non-donor cycles. These results should be taken cautiously as more rigorous research is needed. Compiled from Journals, Internet, and Website resources as a tool to aid ABORM members understand the depth and breadth of Western Style research related to our fields. Zhonghua Nan Ke Xue. 2015 Jul;21(7):637-45. He Y, Chen CT, Qian LH, Xia CL, Li J, Li SQ, Liu BP. To systematically evaluate acupuncture as a treatment for male infertility. We searched Chi na Biology Medical Database (CBM), Wan Fang Medical Information System, China National Knowledge Infrastructure (CNKI), VIP Information Resource System (VIP), and PubMed for published literature on acupuncture as a treatment for male infertility on May 1 2014. Based on the Standards for Reporting Interventions in Clinical Trials of Acupuncture (STRICTA), we evaluated the quality of the reports, conducted meta-analysis on the identified studies via RevMan5.2, and assessed the quality of the evidence in the literature by Grading of Recommendations Assessment, Development, and Evaluation (GRADE). A total of 12 studies involving 2,177 patients were included, the quality of which was evaluated as mediocre. With regard to the cure rate, acupuncture was comparable to traditional Chinese medicine (TCM) (P > 0.05) but better than Western medicine (RR = 4.00, 95% CI 1.63 to 9.82, P < 0.01) while acupuncture + TCM was better than either TCM (RR = 1.77, 95% CI 1.20 to 2.60, P < 0.01) or Western medicine used alone (RR = 2.73, 95% CI 1.51 to 4.93, P < 0.01), and acupuncture + Western medicine was better than Western medicine alone (RR = 1.88, 95% CI 1.17 to 3.02, P = 0.01). The combined use of acupuncture, ear pressure, TCM, and Western medicine showed a higher cure rate than the combination of TCM and Western medicine (RR = 3.45, 95% CI 2.90 to 4.11, P < 0.01). In therapeutic effectiveness, acupuncture was comparable to TCM (P > 0.05) but superior to Western medicine (RR = 1.41, 95% CI 1.12 to 1.71, P < 0.01), acupuncture + TCM was superior to either TCM (RR = 1.14, 95% CI 1.05 to 1.23, P < 0.01) or Western medicine alone (RR = 1.43, 95% CI 1.22 to 1.67, P < 0.01), and acupuncture + Western medicine was superior to Western medicine alone (RR = 1.25, 95% CI 1.05 to 1.49, P = 0.01). In improving sperm concentration, acupuncture was as effective as TCM (P > 0.05) and sham acupuncture (P > 0.05) but outdid Western medicine (RR = 27.00, 95% CI 24.27 to 29.73, P < 0.01) and acupuncture + TCM outdid either TCM (RR = 14.65, 95% CI 7.58 to 21.72, P < 0.01) or Western medicine alone (RR = 1.04, 95% CI–1.43 to 3.51, P > 0.05). 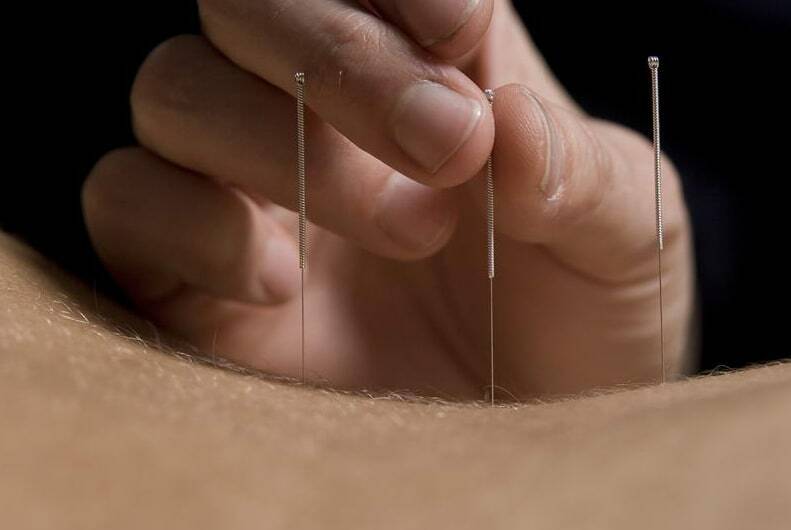 In improving grade a sperm, acupuncture exhibited a similar effect to TCM (P > 0.05) and sham acupuncture (P > 0.05), and acupuncture + TCM was more effective than TCM alone (RR = 7.78, 95% CI 3.51 to 12.23, P < 0.01) but equally effective as Western medicine (P > 0.05). In elevating the level of grade a + b sperm, acupuncture + TCM excelled either TCM (RR = 11.00, 95%, CI 3.17 to 18.82, P < 0.01) or Western medicine alone (RR = 12.22, 95% CI 6.87 to 17.57, P < 0. 01), while acupuncture produced a comparable effect with sham acupuncture (P > 0.05). As for the quality of the included studies, only 3 conclusions of the 23 meta-analyses were assessed to be of average quality, while the others of poor or extremely poor quality. Therefore, the recommendation grade of the conclusions was low. For the treatment of male infertility, acupuncture is reported to be equally effective as TMC and more effective than Western medicine, and its effectiveness is enhanced when applied in combination with either TCM or Western medicine. Acupuncture is distinctively efficacious in improving sperm quality. Nevertheless, the overall quality of the included studies is low.